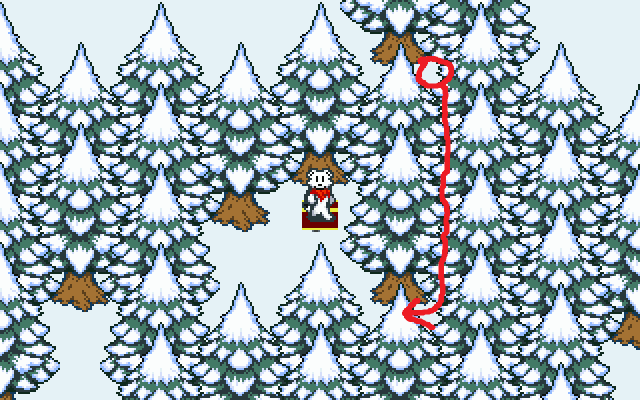 Basically the hero finds a hidden passage spot (where the circle is), activates it, and the script has them walk through the hidden passage and out the other side, then resumes player. However as far as how to rig the walking along a specific path to work, I'm not sure what the best way to do that is. I thought there were hero pathfinding commands, but I just checked plotdict.xml and there aren't any, just NPCs. Was thinking of having hidden passage zone and drawing the path with it, then temporarily writing the wallmap to 0 along those zones and pathfinding the hero, but can't do that apparently. Any other ideas? I just gotta get this implemented quick, still got a lot of other things to work on. Kylekrack just suggested trying to put in "pathfind hero to" and compiling to see if it'd take, and it did. Huh. Can't you just use "walk hero to x" and "walk hero to y" commands when the hero is suspended? It's pretty quick and easy (and accurate) to just tell the script where you want the hero to walk. As far as wallmaps are concerned, I think you can just use "suspend hero walls" and "resume hero walls" to achieve what you want. Is what you want to do more complicated than that? That would work fine for a one-off sequence, but since I'm having several of these on the map, it would be pretty bad to have to manually put in walk sequences into the .HSS file for each one. I ended up actually not using pathfinding and instead went with a "breadcrumb" zone method, where the hero looks for an adjacent tile with the breadcrumb, removes the breadcrumb from the current spot, and moves to the adjacent spot. Here's the working code if anyone's curious. Wow, that looks like a really complicated solution! "pathfind hero to" is documented in the plotscripting dictionary, but is new in Fufluns. You must have been looking at the dictionary for Etheldreme. Note that both of them are linked to from the wiki. The version is displayed at the top, and nightly versions have "nightly" as part of the URL.